This is from the camping and caravanning club. 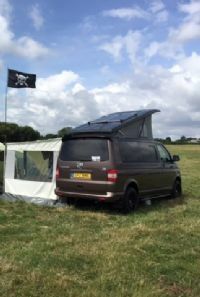 For many people, camping and caravanning are about ‘getting away from it all’ and not being tied down – even to an electric hook-up point. Add to this the cost of a nightly electrical connection and the fact that many of us like the idea of reducing our use of fossil fuels (both through the national grid or a petrol-powered generator) and solar power seems to have much going for it. There are several ways of using the sun’s power to make life easier for camping. Solar showers have been on the market for many years. They generally have a black container that you fill with water and leave in the sun to heat up. It’s then simply a case of letting the hot water out of the bag through a shower head. This is a cheap way of using solar power and is replicated in more sophisticated installations for houses, where solar panels on the roof contain water that heats up and in turn heats the water used inside the home. However , solar power from photovoltaic (PV) panels probably fits more easily into our camping lives. Here the sun’s energy is converted into electricity in the panel. This can be stored in a leisure battery and released again when we turn on an appliance. Finding the right panel for you can be a challenge. Unfortunately, some people are put off solar panels because they buy the wrong one. Too low an output and you’ll find you’re running out of power. Or you could spend a large amount on a top-of-the-range set up and only be using a small proportion of its output, making it seem excessively expensive. One straightforward way to find the type of solar panel that’s right for you is to go camping with a fully-charged battery in your unit, don’t connect to an electric hook-up and see how long your battery powers your appliances. When you return home, find the rating of your battery (it should be marked in amp hours – Ah) and calculate the average energy you’ve used during your trip. For example, if a 110Ah battery has lasted for two days, that’s an average of 110/2 = 55Ah per day. This is a slight over-estimate because you’re unlikely to use the whole of the battery’s capacity before your TV stops working or the water pump fades, but it gives a rough guide. You’ll therefore be looking for a solar panel to top-up your battery by a similar average, in this case by 55Ah per day – remembering that any solar panel will only be topping up your battery when sunlight is falling on it. If you don’t have the opportunity to check your real power consumption on site, you’ll need to estimate it using the power ratings given on every piece of electrical equipment you plan to power from your battery. In electrical terms, power (measured in watts, W) equals current (in amps, A) multiplied by voltage (in volts, V). Y our battery produces roughly 12V to power your equipment, so to work out the drain on your battery from an appliance, take its power rating and divide by 12. For example, a 16W light draws a current of 16/12 = 1.33A. Turn it on for three hours a day and you’ll need 1.33 x 3 = 4Ah every day from your battery to power that single light. Use a 45W 12V television for the same time and you’ll need 3 x 12/45 = 11.25Ah every day from your battery. So, to find out how many amp hours you need from your battery every day, you’ll need to do this calculation for every appliance and add them all up. If you use a crystalline panel, don’t forget that even the shadow of a thin wire can make a difference to the power output. Make sure as many cells as possible are in full sun. 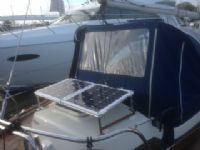 Connecting a solar panel to your leisure battery may be as simple as attaching a couple of clips, but some caravan and motorhome manufacturers provide specific adaptors so it’s worth checking with your local dealer before you buy a new panel. 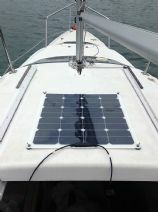 Some solar panels are portable and come with all the connectors required to attach them to your leisure battery, such as the Solar Technology 4W Fold-Up panel. Others can be permanently secured to your unit and may come packaged with a suitable fixing kit. Before you buy, think about how you will use the panels (including whether they will normally be positioned in full sunlight), whether you want to have them permanently fixed and if the attachment points may affect the water ingress warranty of your unit. The power you generate from your solar panel will only be as good as the condition of your leisure battery, so it’s worth looking after your battery. The Club has another Data Sheet – Looking after your leisure battery – to help you do this. The power generated by a solar panel is direct current (DC), so if you want to use it to power something that would normally plug into a home-style three-pin 230V socket you’ll need to convert it to alternating current (AC). For this you’ll need an inverter. Solar panels sold in the UK will be marked with a power rating, which shows the power the panel will produce under prescribed standard test conditions (also known as STC). Although these are very specific conditions (see the separate panel for more details), the existence of STC means you can compare the power outputs of different solar panels quickly and use this as a guide to finding out what you will need to match your camping style. The ratings mean, for example, if you were to put three panels in the sun, one 4W panel should generate the same power as another 4W panel and a fifth of the power of a 20W panel. However, this doesn’t mean you will get 4W (or 20W) every hour during the day. Using the appliances listed in the chart at the top of the page, if you wanted to camp on site using all your equipment in summer you’d need at least a 40W panel to top-up your battery – assuming 6 hours of STC-equivalent light during the day – to give 6 x 40W = 240Wh. However , conditions are not always perfect and there are likely to be other losses not accounted for , so a slightly higher rated solar panel may be more appropriate, such as 45W or 50W. You may also wish to take into account the times of day when you use the appliances. For example, if you are draining all the power when it’s still dark your battery will constantly be dropping below 50 per cent charge before being topped up, which can reduce its useful life expectancy. It may, therefore, be worth upgrading your battery to a higher capacity to support your camping lifestyle. Why do some panels look different from others? There are two main types of solar PV panel – thin film and crystalline. Thin film (or amorphous) panels are produced by spraying a fine layer of semiconductor material on to a surface – in a similar way to the silvering on the back of a mirror. In the past, thin film panels have had a shorter predicted life expectancy than crystalline ones. However, recent developments suggest that this ten-year life expectancy may be rising to 20 years or more, almost matching that of crystalline panels. Thin film panels are generally significantly cheaper than crystalline ones, but they’re also less efficient so you’ll need a larger panel area to give the same power output as a crystalline panel. Crystalline panels also come in two types, mono-crystalline and poly-crystalline. Each module in a mono-crystalline panel is formed from a single silicon crystal. 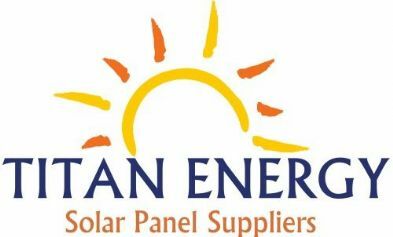 These are the most efficient panels on the market, but also the most expensive. They will also give you the most power per unit area of panel. 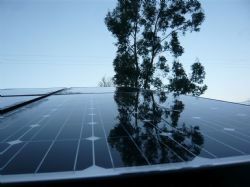 Most crystalline PV panels on the market today are poly-crystalline. They are made of many small crystals jumbled together. The boundaries between the crystals reduce the efficiency of the panel, so you’ll need a slightly larger poly-crystalline panel to get the same power as a mono one. For the panels to top up a leisure battery the difference is minimal, though it’s something to take into account if you’re installing a system at home. There are many devices on the market with built-in solar panels, such as lanterns and chargers for hand-held devices like iPods and mobile phones. They can be useful, but remember you’ll still need plenty of sunlight to charge your gadget. Both of these examples include an alternative means of charging the unit – by plugging it into an electricity supply – in case the sun doesn’t shine. But there are a couple of other things to consider before you invest. Will you be able to put your gadget’s solar panel in the sun for long enough to charge it? On a busy campsite, you may be reluctant to leave a pricey gadget outside your unit to charge, for security reasons. If you’re buying the gadget purely to be eco-friendly, remember energy is required to build the solar panel and connections in the first place. It will need significant use to make it viable in environmental terms and it may never generate as much energy as it took to make it. These are the laboratory conditions used to measure the power output of a solar panel. In real life, the output will differ from these conditions, but you can use STC to compare the power ratings of different panels accurately. Do you need a regulator or charge controller? Larger solar panels can over-charge your battery unless you add a regulator into the circuit, to restrict the current to a sensible level. As a rule of thumb, check whether you need a regulator by taking the rating of your battery in amp hours (Ah) and dividing by ten. If the power (in watts) of your panel is lower than this figure you won’t need a regulator. If it’s higher, you will. So for a 90Ah battery, a panel of 9W or less won’t need a regulator. Anything more than 9W should have one. In real terms, therefore, most solar panels for leisure batteries will need a regulator. Many kits sold for caravans and motorhomes will have one included. When it’s dark, energy can flow from your battery back into the solar panel so there would normally be a diode in the circuit to stop this happening. A charge controller will normally include both a regulator and the appropriate diodes to protect your battery, though the terms ‘regulator’ and ‘charge controller’ are not always defined in the same way, so it’s worth checking exactly what is included in any kit you are looking to buy.